Former Elizabethtown Mayor and Councilman Ken Reighard received the Vincent W. O'Connor Public Service Award at the Elizabethtown Chamber of Commerce's annual dinner Friday, March 26. A lifelong resident of the borough, Ken served Elizabethtown's municipal government for more than 30 years as mayor and a member of council. (Here's a bit of trivia: Ken was mayor during the emergency at Three Mile Island in 1979.) During those years, he also was a director with the Elizabethtown Area Water Authority, a member of the Planning Commission, the Parks Commission and the Civil Service Commission. Ken retired from public service about two and a half years ago after deciding not to run for Borough Council again because of health concerns. I can give credit to Ken for my being elected to Borough Council after his decision not to run again. I met him initially in 1999 when I served as editor of the Elizabethtown Chronicle and covered Borough Council. Later, when I realized that he and I attend the same church, Christ Church United Church of Christ, we connected more frequently and often discuss local politics. After having served on the Elizabethtown Zoning Hearing Board for nearly four years, I remember Ken approaching me in church one Sunday morning. "Jeff, I'd like you to replace me on Borough Council," he said. Replacing wasn't the right word to describe someone who committed so much of his life to serving the community. Consider that Ken's civic service also includes involvement with the Chamber of Commerce, the Rotary Club, American Legion and the VFW. He was a charter member of Willowood Swim Club where he served as director for several years. And at Christ Church, he served as a trustee, deacon, elder and consistory president. And that's why Borough Council selected him to receive the 2010 O'Connor Award. The dedication to making Elizabethtown a better place is something we all talk about and want for our community. Ken actually made that happen over the second half of the 20th century, and for that I -- and I think I can say the rest of Borough Council -- am eternally grateful. 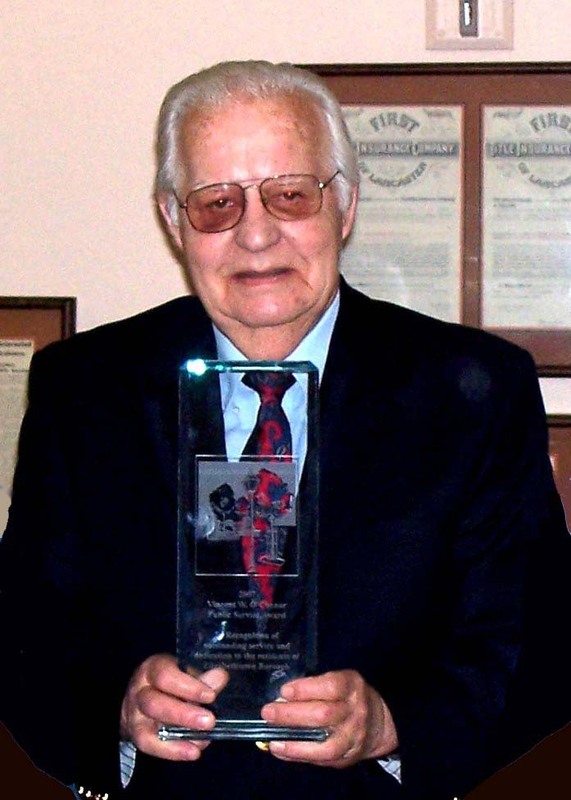 He graduated from Elizabethtown High School in 1949 and completing his higher education at Central Penn Business College and Elizabethtown College. In 1952, he enlisted in the Army and was deployed to Korea. After the war he returned to Elizabethtown where he eventually became manager and owner of Shearer’s Furniture Store and Bob’s Flower Shop. Before retiring in 1995, he was vice president of Mutual Inspection Bureau. Ken and his wife, Clara (Betz), had three children, son Ted, daughter Shirley Byron and son Kim (deceased), five grandchildren, and three great-grandchildren.